Amazon's New Kindle for Kids Bundle Is Great for Everyone! Amazon’s New Kindle for Kids Bundle Is Great for Everyone! Amazon really wants to capture the family media market. They’ve already pushed the Kindle Fire as a great kid-friendly tablet, and now they’re selling a similar bundle using the entry-level Kindle. When you look at the whole package though, it’s great for more than just kids-anyone interested in a Kindle should look at the Kindle for Kids bundle! What makes this bundle “for kids”? Basically, it’s a regular touchscreen Kindle without special offers. This sells for $99 normally. 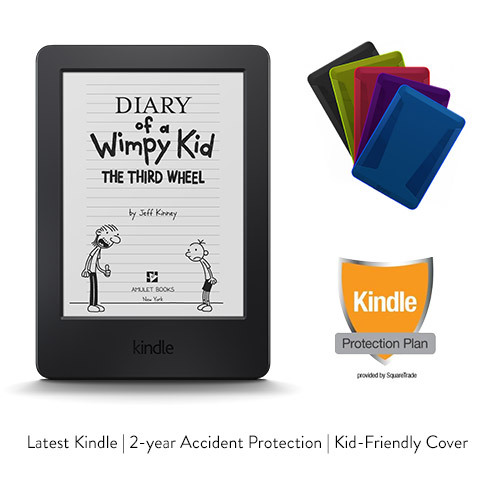 But for the same $99, the Kindle for Kids bundle throws in a case and a two-year warranty from SquareTrade that covers accidental damage. Essentially, there is absolutely no reason to buy the regular touchscreen Kindle, when you get a better warranty and a free case with the Kindle for Kids bundle instead. This is a regular Kindle, so it has the parent-friendly Kindle FreeTime option, but if you’re buying it for yourself then you can just ignore those features and get right to reading. The case looks like a simple TPU style case, so while it won’t protect your Kindle like an Otterbox it will certainly give it some grip. And Amazon’s partnership warranty with SquareTrade covers just about everything-drops, water damage, surprise dog chew toy mistakes, etc. This is probably the best deal you can get in ebook readers right now-a free case, an ad-free Kindle, and no worries if you take your Kindle to the beach! Whether you’re a parent or just an avid reader, be sure to check out the Kindle for Kids package; your wallet AND your imagination will thank you.